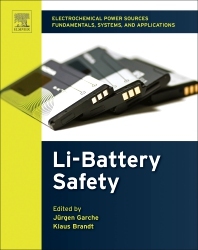 Safety of Lithium Batteries describes how best to assure safety during all phases of the life of Lithium ion batteries (production, transport, use, and disposal). About 5 billion Li-ion cells are produced each year, predominantly for use in consumer electronics. This book describes how the high-energy density and outstanding performance of Li-ion batteries will result in a large increase in the production of Li-ion cells for electric drive train vehicle (xEV) and battery energy storage (BES or EES) purposes. The high-energy density of Li battery systems comes with special hazards related to the materials employed in these systems. The manufacturers of cells and batteries have strongly reduced the hazard probability by a number of measures. However, absolute safety of the Li system is not given as multiple incidents in consumer electronics have shown. Prof. Dr. Jürgen Garche has more than 40 years of experience in battery and fuel cell research & development. In his academic career the focus was on material research. Thereafter, he worked on and directed cell and system development of conventional (LAB, NiCd, NiMH) and advanced (Li-Ion, NaNiCl2, Redox-Flow) batteries. His experience includes also fuel cells (mainly low temperature FCs) and supercaps. He established the battery & FC division of the ZSW in Ulm (Germany), an industry related R&D institute with about 100 scientists and technicians. His interest in battery safety goes back to the work with the very large battery safety testing center of the ZSW. In 2004 he founded the FC&Battery consulting office FCBAT; furthermore he is a senior professor at Ulm University. Dr. Klaus Brandt has over 35 years of experience in research, development and manufacturing of lithium and lithium ion batteries. He co-founded Moli Energy in Canada which produced the first rechargeable battery with a lithium metal anode. In the field of lithium ion batteries, he worked in various management positions for battery companies like Varta and Duracell. His last industrial position was with Clariant which produced cathode and anode active materials for lithium ion batteries.